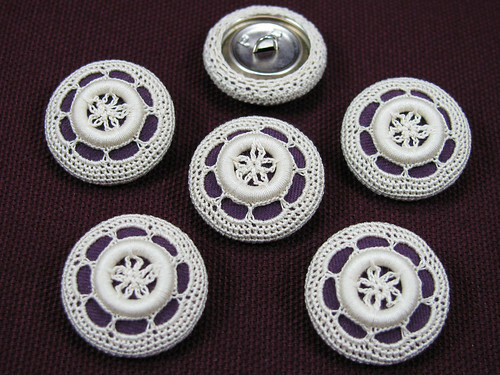 This set of 6 crocheted buttons I made using a pattern from Nancy Nehring’s book “50 Heirloom Buttons to Make”. I used an ecru crochet cotton in size 100 and a size 14 Susan Bates steel crochet hook. The top button I turned over to show the decreases that pull the crochet tight around the button. I made these to go with a crochet collar that I will blog about on another day. Each button is 1″ in diameter. The rings around the flowers are a little on the thick side being plastic instead of brass. I had trouble finding the right size rings, and being impatient I used the thick ones. Lately I have noticed the thinner ones in drapery departments, so I just may have to make another set of these fun to make buttons. This entry was posted on Friday, November 7th, 2008 at 3:00 am and is filed under Crochet. Tagged: Button, Crochet. You can feed this entry. You can leave a response, or trackback from your own site. Could you tell me where to get a copy of 50 Heirloom buttons to crochet? You did such a beautiful job, and I would love to have this book.